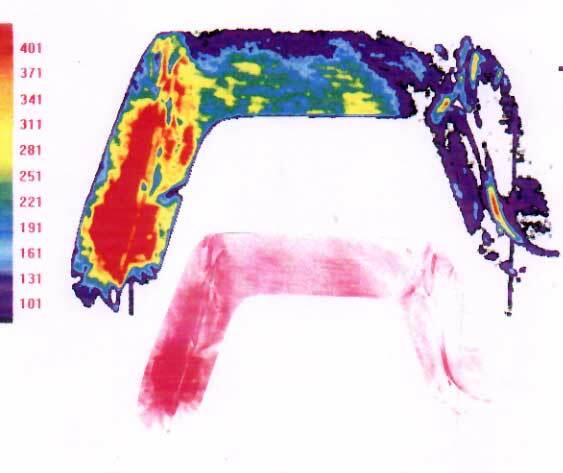 This impact simulator test was conducted for Dr. Scott Haack by Transportation Research Center (TRC) to evaluate the performance of the SoftTouch medical implant protection device attached to a seat belt compared to the performance of a seat belt alone. The test also evaluated the two components of the device, the free air space portion and the silicone track portion. The free air space portion of the device is designed to protect the area of the patient's chest where a defibrillator, pacemaker or chemotherapy port would be located. The acceleration was simulated by NHTSA's Office of Vehicle Safety Compliance (OVSC) Laboratory Test Procedure No. TP-208S-01, dated January 15, 1998. The Hyge sled was instrumented with two (2) accelerometers to measure longitudinal accelerations and one (1) light trap velocity channel. This rest was conducted with two (2) ballast 50th percentile, anthropomorphic test devices (dummies), one each in model year 1995 Toyota Camry driver seats mounted to the TRC flat plate. The seats were oriented to simulate longitudinal accelerations that would be encountered in a frontal impact crash, and equipped with three point restraints and identically fabricated D ring supports. One (1) dummy was restrained with a seat belt only, and one (1) dummy was restrained with a SoftTouch medical implant protection device around the shoulder belt portion of the seat belt. Upon examination of the ballast dummy's chest cavity, the SoftTouch medical implant protection device was positioned on a portion of the dummy's chest that afforded the most support for analytical purposes, although it was not positioned in a location where a chest defibrillator, pacemaker or chemotherapy port would typically be located. The SoftTouch medical implant protection device was installed by Dr. Haack. 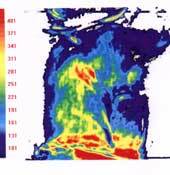 Tactile pressure indicating sensor film was utilized to measure the overall distribution and magnitude of pressure forces between the dummy's chest and the shoulder belt or between the dummy's chest and SoftTouch medical implant protection device, respectively. 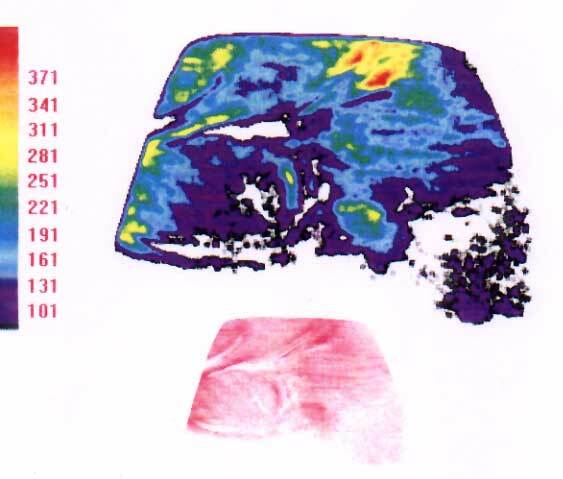 The film also indicated the distribution and magnitude of the pressure forces between the dummy's chest and the silicone track and free air space portions of the medical implant protection device, respectively. 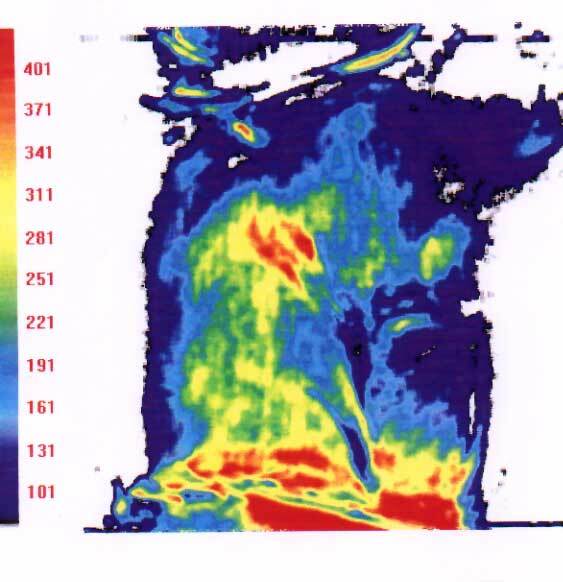 All electronic data were digitally sampled at 12,500 samples per second and filtered per SAE J211, Mar 95. The test was filmed by one (1) high speed camera, operating at approximately 1000 frames per second. The data contained herein are results from Hyge impact simulations. The data are research and development data and do not constitute certification data. Transportation Research Center Inc. assumes no liability for the use or interpretation of this report or its data. Free air space where pacemaker, defibrillator , or chemotherapy port sit underneath SoftTouch device. 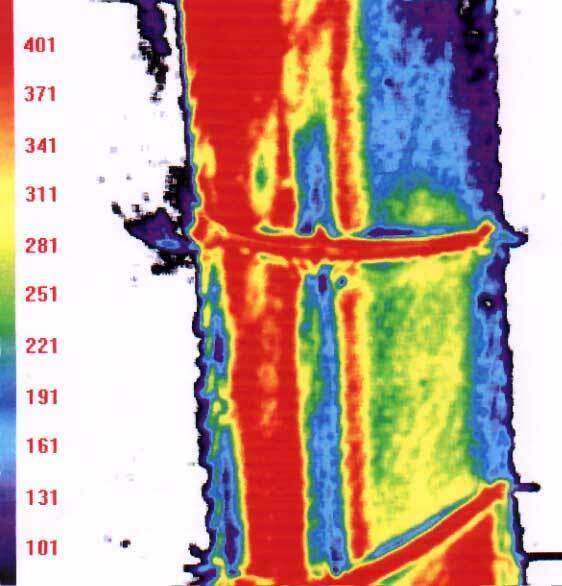 As shown in the preceding tables, the silicone track portion of the device showed a 17% decrease in average pressure from that of the seat belt alone. And the free air space portion of the device exhibited a dramatic 34% decrease in average pressure from that of the seat belt alone. 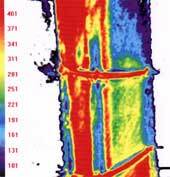 By just placing the SoftTouch device on the seat belt the force per area of the belt above and below the device was reduced by 24.5% of the original 233.4 psi reading. (see below).